I'm a shocking swimmer, so the open sea scares the hell outta me. Despite this, I've got a fascination with the mysteries of the deep and an appreciation for its beauty. After all, we've explored less than 5% of the Earth's ocean. Let that sink in – less than 5%! Hundreds of billions are spent on space exploration, yet oceanographic expeditions pale in comparison. We've got this incredible ecosystem right on our doorstep people – let's unlock the mysteries! Undines are a group of elemental beings associated with water. They morphed later in literature to water nymphs. Undines are pretty much always attractive females, the most well known being mermaids. Despite their human form, they lack a soul and the only way to gain one is to marry a human. Interestingly enough, any human who marries an Undine and is unfaithful is fated to die shortly thereafter. BUMMER! Wow – imagine if those rules applied to normal marriages? We'd have people dropping right left and center! Anyway – Undine's Deep is a spectacular visual feast brought to us by Endorphina that can be played on PC, mobile device or tablet. With sea reeds moving gently in the background, I almost felt like I could swim straight in the screen and start a search for my very own Undine. Undine's Deep is a high volatility 5 reel and 10 payline slot. The wild is, a bit disappointingly, a goldfish (common guys really – a sea full of wonders and that's what you come up with?) and can substitute for anything except the scatter. What's the scatter? Well, it's a beautiful Undine/Mermaid who will no doubt visit me in my dreams very soon. The standard symbols are 10- Ace icons plus a starfish, jellyfish, anemone, seahorse and shell. Controls are the same turquoise blue color as the ocean, with Credits appearing on the top of the reels and the rest below: Bet, Menu (including Paytable and Advanced Autoplay Options), Total Bet, Auto, Spin and Lines. Float gently along the ocean floor and relax, because there's no Turbospin. After each winning spin in regular play, a “Take Risk” option is offered in which you can attempt to double your profits by selecting a higher card than the dealer. 3 scatters anywhere triggers 15 re-triggerable Free spins with a 3X multiplier! A substituting wild forming any part of a winning payline will double those winnings! 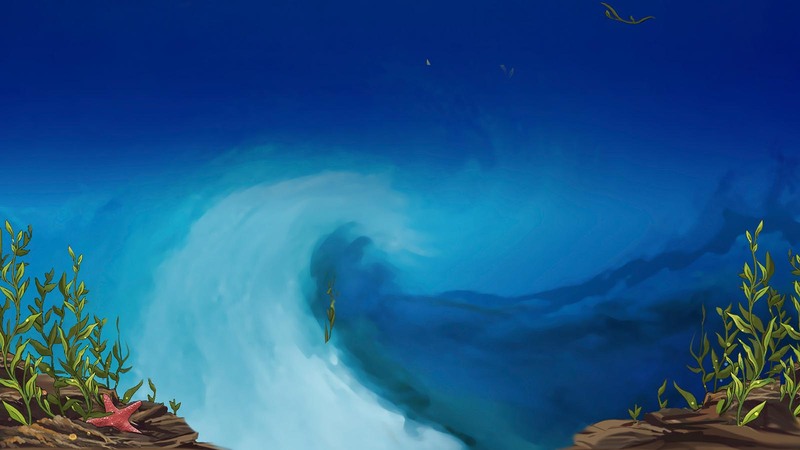 The background animations are the standout here – Sea-life comes in and out of the background, floating with the tide. The graphics of sea creatures are a bit too textbook, but the Undine herself is alluringly rendered, to say the least. Performance wise I had zero issue, complaints or lags on any device tested. Awesome Free Spins with Multipliers. Then, hopefully, after a big win on this video slot, we'll all have blissful dreams of the Beautiful Undine.